Sheena and Kazaruth walked towards each other on the barren land of the Salt Flats. Each could see the other, but neither's face showed any recognition of the other. Both of them had been instructed by their Elemental Lords to travel through the Salt Flats. Neither of the inexperienced priests knew why, but did as they were instructed. Finally the two of them stood not 30 feet from each other. Each had been instructed not to wear the clothing that would normally identify them as priests of their element. Kazaruth mumbled a spell under his breath as Sheena studied him. When Kazaruth completed the incantations a warm feeling enveloped him as it often did when casting magma spells. Immediately a dark blue sphere appeared over Sheena's head indicating that she was a Rain Priest. Sheena stared as Kazaruth wondering what was going on and why she had been drawn here. Suddenly Kazaruth shouted maniacally, "MAGMA, magma shall destroy the rain!" The magma priest made no attempts to hide his spell casting this time as he shouted to the Magma Spirits to aid him. Sheena quickly uttered a spell of Elemental Defense against Magma and her skin became slightly damp. A ball of molten lava appeared in Kazaruth's hand and within moments was flying toward Sheena. The ball slammed into Sheena covering her with molten lava that quickly hardened and fell from her body without harming her. Kazaruth stood shocked that his spell had not harmed the Rain Priest. 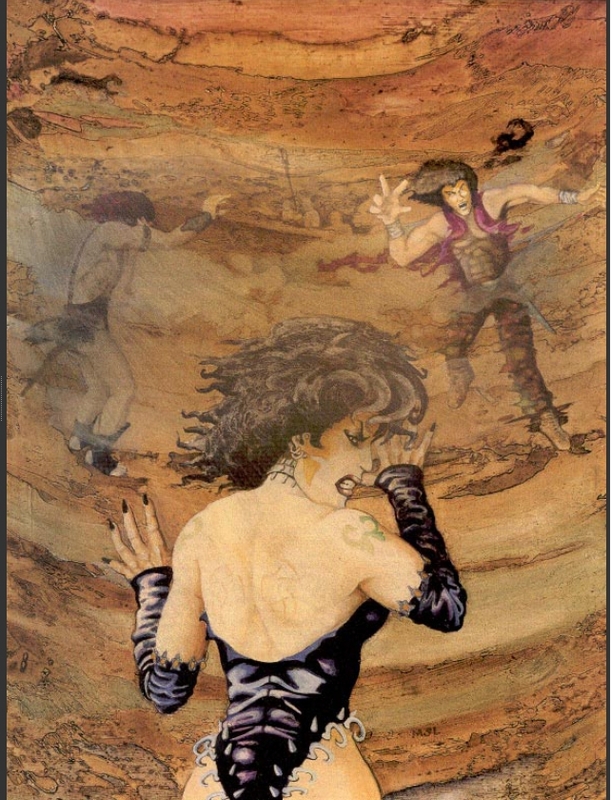 Sheena quickly began the incantations of another spell as Kazaruth began to run toward her. A few moments later Kazaruth was less than 10 feet away from Sheena. Pullin his obsidian bladed axe, he charged. When Kazaruth was perhaps 5 feet from Sheena a small creature appeared between them, its skin was light blue and had boney spikes along its arms and legs and four small wings extended from its back. The small creature hissed and flew toward Kazaruth without hesitation. The magma priest hesitated for a moment and the small creature flew in and bit him on the cheek as Kazaruth flailed at the creature trying to stop it from biting him. Sheena pulled her Agafari mace out and slammed it into Kazaruth's chest as he flailed at the small Elemental Rain creature. The force of her blow cracked his ribs, which punctured his heart. In seconds Kazaruth lay on the salty ground, dead. The small elemental servant waited for a moment looking to its summoner for more instructions. Sheena dismissed it and headed back to Nibenay, no longer feeling to pull toward the barrens of the Salt Flats. This spell summons a halo of light to appear over an individual. The color of light depends on the individuals elemental sphere of worship. Anyone can see the halo of light but the halo itself doesn't even provide light to see by any means. This attack spell summons a small ball of lava that causes 1D3+1 points of damage to a target. However, once the priest has attacked with the ball another is created to be used the next round. The character may create one per level. This goes to a max of 5 bullets. A first level cleric would summon only one lava bullet but a 2nd level cleric would receive one more the next round, for example. At 8th level the caster may create 2 balls per round and attack with both in one round. This spell summons a weak combative elemental being of the element or para-element of the priest who summoned it. Each variety is different thus having different advantages and immunities. Earth servant: The Earth servant has 1D6+1 HP, can attack for 1D2+1 damage per attack per round, can move at 5 yards per round, and has an AC of 8. Air servant: The Air servant has 1D6 HP, can attack for 1D2 damage per attack per round, can move by flying at a movement rate of 15 yards per round, and has an AC of 7. Fire servant: The Fire servant has 1D6 HP, can attack for 1D2+1 damage per attack per round, can move at 10 yards per round, and has an AC of 8. Water servant: The Water servant has 1D6 HP, can attack for 1D2 damage per attack per round, can move at 10 yards per round on land or 15 in water, and has an AC of 8. Magma servant: The Magma servant has 1D6+1 HP, can attack for 1D2+1 damage per attack per round, can move at 5 yards per round, and has an AC of 7. Rain servant: The Rain servant has 1D6 HP, can attack for 1D2+1 damage (lightning shock) per attack per round, can move by flying at 15 yards per round, and has an AC of 8. Silt servant: The Silt servant has 1D6 HP, can attack for 1D2 damage per attack per round, can move at 10 yards per round, and has an AC of 7. Sun servant: The Sun servant has 1D6 HP, can attack for 1D2 damage per attack per round, can move by flying at 15 yards per turn, and has an AC of 7.